· Cams vs. Stall Converters - When it comes to picking a cam and a converter, there are a number of decisions to be made. Is the car really a racecar, or is it driven on the street 90% of the time? How hard do you want it to launch, what are the rear gears, engine cubic inch, weight of the car? All of these things directly relate to the stall and the cam(s) that you pick for the vehicle. The question really is: Where does the engine start making torque with the cam you have picked? Now, if you have already run your setup on the dyno, that would be the best indication as to what stall converter to run. If you already have a modified stall converter and now need a cam, you really want to know where that stall comes in, so you can get a cam that best matches that starting RPM range of your setup. For more than 50 years, Crane has been known for producing top-quality products that provide customers with unmatched performance. During the next several months, Crane will be looking at every aspect of the organization with an eye toward continuous improvement. Our goal is to strengthen Crane’s position in the marketplace for camshafts, valve train, and electronic parts and accessories. We are making a major investment in new manufacturing equipment, a complete upgrade and expansion of our R&D department with new state-of-the-art equipment and additional engineers, and reinforced employee development and training throughout the company, all of which will lead to the rapid development of new products in all of our categories. We will settle for nothing less than being recognized as the industry leader in camshafts, ignition and valve train products! Spotlight On Lance Harris, CEO of Crane Cams Inc. The past few months have been a busy time at Crane Cams as we institute the many changes necessary to improve the service we provide to our customers. Bringing Lance Harris on board as our new CEO is a cornerstone in our efforts to continuously improve all phases of our business. Lance has a Bachelor of Science Degree from GMI Engineering and Management (formerly General Motors Institute), and both a Masters of Business Administration and a Masters of Engineering Management from Northwestern University. Lance brings an impressive background to Crane. Most recently, he was the Chief Operating Officer at FormTech Industries, a $350 million+ manufacturer of precision forged and machined components for automotive, heavy truck and industrial markets consisting of seven facilities and 1,000 employees. During his tenure there, Lance played an instrumental role in the successful acquisition of a division from Metaldyne Corporation, and he drove the implementation of an aggressive sales initiative to fill open capacity that yielded $100+ million in incremental new business, including key wins with new domestic automotive and industrial customers. Previously, Lance was Vice President and General Manager: at GKN Sintered Metals, in Auburn Hills, Michigan, where he had profit and loss responsibility of the $200+ million Engineered Components Group consisting of nine manufacturing facilities with 1,100+ employees supplying engineered components and assemblies to various industrial markets including automotive, medical, defense, off-road vehicle, and specialty applications. At GKN, Lance was responsible for directing the Sales and Marketing, Technology and Engineering, Manufacturing, Finance and Human Resources functions. Previously, as Vice President of Manufacturing at GKN, he implemented a global Six Sigma and Lean Manufacturing program to drive dramatic improvements in delivery, quality and cost on a worldwide basis, and he championed key strategic investments in technology that resulted in creating a sustainable competitive advantage, and he managed the turnaround of three manufacturing facilities. At MascoTech Sintered Components, Inc., in Pontiac, Michigan, Lance served as Director of Operations with profit and loss responsibility for a $140+ million group with 850 employees engaged in manufacturing precision metal components for the automotive and heavy truck market segments. He championed development of a high speed CNC machining concept that proved instrumental in securing a $24 million contract and streamlined conventional powder metal operations resulting in a $1.8 million profit improvement. Previously at Masco Tech, Lance had profit and loss responsibility for a start-up high volume automotive facility with $55 million in sales and 275 employees, where he directed team efforts to achieve record low customer returns (7 PPM), QS-9000 certification, Corporate Customer Satisfaction Award, Ford Q1, Chrysler Gold Penta Star, State of Indiana Quality Award and Chrysler benchmark status, and he spearheaded the development of a continuous improvement culture and implementation of lean manufacturing concepts. He also had prior experience as Operations Manager and a Project Manager. Earlier in his career, Lance worked as a Project Manager at two different divisions at Stryker Corporation in San Jose, California, and Arroyo, Puerto Rico; and he started his career at General Motors of Canada in various positions. We are very excited to have Lance on board and strongly feel he will be instrumental in restoring Crane to its former prominence and beyond. Welcome aboard Lance, from the crew at Vinci Hi-Performance. 603.5 HP & 589 FT LBS TORQUE FROM STOCK SHORT BLOCK WITH 108,000 MILES ON IT! ProCharger’s twin air-to-air intercoolers really help, keeping the ambient air temperature down, but Crane felt the need to up the injector size to 41 lbs and replace the stock fuel pump. Billet rails, along with stainless lines and fitting, completed the installation. The Street Shark’s Auto Meter fuel pump pressure maintains a constant 60 psi. Vinci High Performance dialed in Crane Cams PowerMax Power Tuner at the SuperCharger mode with Stage 2 cam selection with fuel @ 10% rich. Pre-dyno test was to check driveability; was it rich/lean? The Innovate Motorsports Air Fuel Ratio was reading 13.5 to 14.5 just cruising around. Not bad, but owner Tony Shultz was curious as to how much boost (size of pulley) had ProCharger recommended? They recommend a maximum of 8 lbs. on a stock LSX engine. First pull on Vinci’s DynoJet dyno netted 531.3 RWHP with 510.1 torque. Vinci played with the fuel and timing via Crane’s PowerMax Power Programmer, and the next pull netted 575.7 RWHP and the torque @ 537.5. Last mod Tony Shultz wanted to try was a 90 mm throttle body and C6 Corvette MAF sensor. Just swapping this lost power and torque, as Vinci expected, equaled 532.5 RWHP and 489. torque. After repeated dyno runs calibrating the fuel and air tables, Vinci finished with 603.5 RWHP and 558.2 ft. lbs of torque! Needless to say, Crane and Tony were extremely excited about the results. A larger percent obviously came from the ProCharger. Crane’s shaft mount rockers added 20 horsepower and the “Quick Lift” in the Zcam, along with the Mikronited processed parts, contributed to the overall horsepower numbers. Daytona Beach, FL. - 2006 was a tremendous year for Crane’s Project Car, Street Shark. The results are impressive to say the least. The torque and horsepower numbers represent a very conservative boost level. Keep in mind this is the stock short block with 108,000 miles on the clock! The following is a review of events pertaining to MOD IV. Orlando, FL. - Vinci High Performance Center: The first upgrade Crane Cams wanted to test was the Mikroniteâ Technologies process on the ring and pinion. We wanted the test to be “apples-to-apples,” so an exact GM gear was purchased from the local GM dealer then Mikroniteâ processed and installed with the same bearings and Amsoil 75W-90 Sever Duty Synthetic gear lube. We calculated the horsepower and torque figures would improve but what about mileage? In an unofficial test, Tony Shultz, the owner, drove a controlled loop from Orlando to Daytona for two days. Driving style, same gas station, same pump and same pump shut-off method was used. The results were 24.4 mpg before Mikroniteâ and 26.35 mpg after Mikroniteâ!! Oh, by the way, the Shark spun the roller @ 13.7 more RWHP horsepower with 15 more foot-pounds of torque! Vinci High Performance ported oil pump. Gears and pump cover received the Mikroniteâ process. Also included in MOD IV was a beautiful pair of polished tall aluminum valve covers manufactured by Wegner Automotive Research, (920) 394-3557, their Pt. # 1771238. Wegner tall valve covers are required with Crane Cams shaft rockers or Crane’s new LSX valve cover spacers, Crane Part # 144601 (center bolt 1991-up) or Part # 144600 (outer bolt 1997-99). The fine folks at AutoMeter Gauges sent their new Sport Comp II full sweep gauges for fuel pressure, Part. # 3663, Boost/Vacuum, Part. # 3607, plus their trick triple-pillar gauge mount. Filling the third hole is Innovate Motorsports Technology, Inc.’s XD-16 Stand-a-lone Gauge kit w/ LC-1, Part. # 3781 Air Fuel Ratio Meter and Wideband 02 Sensor. To haul this beast down at speeds, the Street Shark uses Baer brakes, calipers and slotted rotors. After discussing the MOD IV performance upgrades, Baer sent their new Baer/Alcon 6R MonoBlock Calipers w/ bigger rotors. Last, but not least, ProCharger SuperCharger Systems is the newest preferred manufacturer of Crane Cams 50th Anniversary Project Vehicle Part. # 1GJ204-SCI, including their D-1SC ProCharger, twin air-to-air intercoolers + 8-rib drive pulley kit. The Trevor Johnson CNC ported heads were disassembled to machine the stands down and bore out the pushrod holes (for bigger and stiffer 3/8 pushrods). Crane Cams newest Pro Series Shaft Rocker kit takes advantage of Crane’s Quick Lift technology but requires machining. While the heads were being machined, off came the front timing cover and in went the Mikroniteâ processed Zcam, Mikroniteâ processed timing chain set, Mikroniteâ processed oil pump gears and pump cover with Vinci High Performance ported housing. The Trevor Johnson CNC heads with Ferrea stainless steel valves and Mikroniteâ processed Crane Cams new High-Rate Dual Valve Springs, Part # 144833-16, titanium springs, retainers, locks and spring seats were torqued into place. Vinci’s head technician, Greg Warner, installed the new Crane Cams Pro Series Shaft Rockers to check pushrod length. Greg determined the perfect preload length to be 7.350”, Part. # 95627-16. Next up were the Wegner Tall Valve Covers. Greg “clayed” them for clearance, but they cleared without a hitch. Tony Shultz installed the ProCharger kit with minimal hiccups. Who would guess a Formula would be different from a TransAm? Tony decided to install ATI’s harmonic balancer, Part. # 917242 with their crank pinning kit. This kit allows the 8-rib upgrade to bolt right on. The last upgrade before the dyno sessions would be the fuel system. Whenever you’re force feeding an engine, i.e. Nitrous, Turbo or, in this case, Supercharging, your attention to supplement fuel for the pressurized air, along with very careful timing parameters, allow you to make huge horsepower while keeping your air/fuel ratios in the safe zone. For your viewing pleasure, click on this link to view the Mod III (natural aspirated) to Mod IV Supercharged version: http://www.cranecams.com/dynos/streetSharkDyno12207.pdf . The Crane Cams website will be updated with this information plus additional dyno charts and pictures. Crane Cams was the talk of the show! Customers, factory associates, and even our competitors were talking about Crane Cams and Mikronite Technologies. The Crane booth was extremely busy all three days! We introduced our NEW 60mm Top Fuel 9310 Steel Billet cam core, and our NEW LS Pro Series Shaft Rockers for stock and aftermarket LSX heads. If you would like new product information on these products, go to: www.cranecams.com. The Mikronite seminar, “Xtreme Surface Enhancement For Performance,” filled the room. Exit interviews were very interesting. Most came away with knowing the difference in all the metal finishes and realizing how they could attain a performance edge by a stronger component, less friction and cooler operating temperatures. Racers are happy with one, but to receive all three benefits, you could read the customers’ faces when they came to the booth asking how many components would benefit from the Mikronite process. Listed below are some PRI facts: In parentheses are the numbers from last year ( the first PRI show held n Orlando). Over 3,900 guests attended the Grand Opening Breakfast, with Tony Stewart… Over 6,500 eggs were served! The Snap-on All-Star Kart Race was a great success, even with the rain! How Do You Define Horsepower? Ask a car enthusiast and most of the time, you'll get a blank look, a shrug of the shoulders and maybe a guess along the lines of "What a horse can do!" Horsepower is defined as work done over time. James Watt in the late 1700’s had figured the exact definition of one horsepower to be 33,000 lb.ft./minute. In other words, if you were to lift 33,000 pounds one foot over a period of one minute or 550 pounds per second, then you would have been working at the rate of one horsepower or equal to 746 watts. To help sell his steam engines, Watt needed a way of rating their capabilities. The engines were replacing horses, the usual source of industrial power of the day. The typical horse attached to a mill that grinded corn or cut wood walked a 24 foot diameter circle. Watt calculated that the horse pulled with a force of 180 pounds, although how he came up with the figure is not known. Watt observed that a horse typically made 144 trips around the circle in an hour, or about 2.4 per minute. This meant that the horse traveled at a speed of 180.96 feet per minute. Watt rounded off the speed to 181 feet per minute and multiplied that by the 180 pounds of force the horse pulled (181 x 180) and came up with 32,580 ft.-lbs./minute. That was rounded off to 33,000 ft.- lbs./minute, the figure we use today. As we highlighted in last week’s newsletter, we just completed our annual PWA Conferences with the member performance warehouses in Phoenix. Among the many topics discussed was the pending sale of Crane to Mikronite Technologies Group. We expect a final closing to be on or before this Friday. We all look forward to this milestone, as it will mark the beginning of a new era of opportunity at Crane. The purchase brings capital resources to support the dramatic expansion in our finished goods inventories and the purchase of critically needed capital equipment to up-grade and replace some of our most critical equipment to insure ongoing product needs are met, now and in the future. Upon closing, Jeff Coats, the President and CEO of Mikronite will also assume the role of President and CEO of Crane Cams Inc. Gene Ezzell will take on the new role of President of Mikronite Automotive Technologies, a newly formed segment of Mikronite, to expand and grow Mikronite’s metal finishing business throughout other segments of the automotive industry. Vinci High Performance is earning their money. Be Cool sent their pototype radiator for F-bodies with LS1. Vinci’s crew struggled but after numerous test and modify fits, they achieved success. There’s limited clearance between the stock thin radiator and the ProCharger Supercharger. Add a thicker core radiator, and it gets super-tight. On a more normal install, the high volume fuel pump, billet fuel rails and 44 lb. injectors went pretty smooth. We spent two days installing Auto Meter’s fuel pressure and boost gauge along with Innovate’s air/fuel ratio gauge. Boring a hole through the firewall on a late model vehicle isn’t what it used to be! Next up, a new upper radiator support. One of our Techs, Mike Covello, is a road racer. He’s built many custom sheet metal parts for his racer, so he volunteered to build a new one. Stay tuned and next week, we should have dyno numbers and fuel mileage results. No, it’s not Kotter we’re welcoming back for all of you TV buffs, it is a hearty welcome back to Glen Howard to our Crane sales team. Last week, we had the chance to lure Glen back to the team, and he’s a perfect fit as we continue the rejuvenation of Crane. Most of you know Glen, and are aware that he is a talented sales manager with a great in-depth understanding of the performance industry and the products and services needed to support this market. He will be focusing the majority of his time on our key accounts and how to build and support business in this competitive marketplace. We are delighted to have Glen back and look forward to a strong team participant in having what you want when you want it! Las Vegas, NV October 31st to November 3rd: What do 59,476 qualified buyers and more than 9,000 International buyers have in common? The SEMA SHOW 2006 - where everything NEW makes its debut! That’s were you’ll find Crane Cams. Look in the front of the Racing & Performance Central Hall. Remember Booth 22233 for your entire racing and performance needs. We won’t tell you what’s new. You’ll have to come by the booth and see for yourself! What booth number? 22233! See you in two months! · The 2006 Bonneville Nationals had another significant record broken when driver Jimmy Shine piloted Tony Thacker's D/BSTR to a new mark of 206.454 MPH. This supercharged small-block Chevrolet powered vehicle was a project developed in conjunction with Bill Mitchell and World Products. A Crane cam, roller lifter set, and complete Pro Series shaft mount rocker arm system was installed to provide the horsepower and reliability required to achieve this mark. Congratulations to Jimmy for entering the 200 MPH club, and to the entire team for their stellar efforts this year! hitch. We wanted to prove the power potential of the bigger Zcam, Pt. No. air/fuel ratio meter & wideband 22 sensor. and highly Modified LS1 intake all recommended and supplied by Thunder Racing. and the crew at Thunder Racing. install all these great products and dial the car in on their Dyno. plus what our street fuel mileage ends up. Stay Tuned!! Crane Technologies Group, Inc. of Daytona Beach, Florida. announces it is being acquired by Mikronite Technologies of Eatontown, New Jersey. Although still subject to shareholder approval, the transaction is expected to be completed within 60 days. Mikronite is an industrial technology firm with contracts in the aerospace, automotive, commercial and medical fields. Its current customers include The Black and Decker Corporation, Liberty Gears, Vinci Hi-Performance and other well-known names in the performance automotive arena. Crane, a world-recognized manufacturer of camshafts, valve train and electronic components with a storied 53-year history, markets some of the most recognized brand names in the automotive performance industry. Mikronite and Crane have enjoyed a business association for over a year. In a joint announcement, Jeff Coats, CEO of Mikronite, and Gene Ezzell, CEO of Crane, commented that the acquisition of Crane by Mikronite will build on this relationship and provides a solid platform for growth as Crane incorporates the Mikronite metal finishing process into a wide variety of high quality performance parts marketed through a variety of channels world-wide. Coats further remarked, “Combining Mikronite and Crane will strengthen what has already been a very positive association. The strength of any business rests on the quality of its employees and on the development of new products and services. Mikronite has developed a truly unique process that has tremendous potential in the automotive performance market. I see a bright future together and look forward to combining our patented Mikronite® technology with the people and capabilities of Crane, a company with such a rich tradition and highly respected name in the industry.” Mikronite expects to provide to Crane over $8 million in new cash equity and equipment-related financing. Crane will continue its operations at 530 Fentress Boulevard, and Mikronite is considering relocating some of its operations and employees to Volusia County. Current Crane personnel will essentially remain in place, and customers should enjoy a seamless transition. Ezzell commented; “This infusion of resources will allow Crane to fulfill its commitment to customers to have what they need when they want it.” He went on to say that significant investment in machines, equipment and inventory is planned over the coming months to insure that this commitment is kept. In conjunction with the closing of the transaction, Coats will assume responsibilities as President and CEO of Crane. Ezzell will become President of Mikronite Automotive Technologies and will focus on developing new business for Mikronite in the automotive and industrial markets through his many years of experience and relationships. Package #1: Improved fuel economy, improved low end and midrange power, stock sounding idle. VHP / Crane "043" camshaft (210/218° @ .050” lifter rise; .531/.531” valve lift w/1.7 rockers, .562/.562” valve lift w/1.8 rockers, 114° LSA): 1.8 “Quick-Lift” roller rockers, # 144759-16; 144832-16 valve springs; 144944-16 steel retainers; 144460-16 valve spring seats. This package will provide a power increase and general driveability increase with stock tuning, but the package really wakes up when tuned to camshaft performance level 2 with the VHP / Crane 1202-003 tuner. Idle is completely stock sounding and the vehicle can be driven to the dealership for service on the stock tune if necessary. Performance is anything but stock, with no loss in torque off idle and a huge torque increase starting at about 1600 RPM and continuing to 5800 RPM. Ideal for towing, this package is totally compatible with the stock torque converter and is recommended for 4.8L and 5.3L engines. The 2003, 5.3L 2WD Tahoe owned by Crane VP of R&D, Mark Campbell, is fitted with this package and consistently gets 20-20.3 MPG on the flat roads of Florida. On a round trip from Daytona Beach to Cincinnati, the vehicle averaged 19.3 MPG for the trip, which consisted of a long distance through the Smokey Mountains. Package # 3: Improved fuel economy and towing torque for 6.0L applications, healthy sounding idle. VHP / Crane "045" camshaft (216/224° @ .050” lifter rise, .551/.551” valve lift w/1.7 rockers, .583/.583” valve lift w/1.8 rockers, 115° LSA); 1.8 “Quick-Lift” roller rockers, #144759-16; 144833-16 valve springs; 144661-16 titanium retainers; 99108-1 machined valve locks; 144460-16 spring seats. This package is ideal for towing for 6.0L applications. With a healthy idle note, there is no loss of torque off idle, and a huge torque increase starts in at 1800 and carries consistently and smoothly through 6100 RPM. Tuning with the VHP / Crane Power Tuner on the Camshaft Performance Level 3 is required. Like the two cams above, this cam is totally compatible with the stock torque converter. Tests have shown a 5% increase in fuel economy driving “unloaded” around town and a 7% increase “unloaded” on the highway. However, towing is where this cam shines. Towing a 10’6” high, 35’ long fifth wheel trailer with a 1999, 6.0L 4x4 PU, a Michigan customer realized a 15% increase towing at 73 mph compared to what he got with the stock engine towing at 67 mph. He reports that the fuel economy improvement, along with the driveability improvement, makes this package a winner. As the parts manager for a GM dealer, he is now recommending this package to customers. Additionally, this cam is great for a “sport truck” with a 5.3L engine that won’t see heavy towing. One of the previous two cams is a better choice for a 4.8 or a 5.3 that will see heavy towing. One thing to keep in mind with any of these camshafts is the more the engine is loaded (as in a towing application), the greater the fuel economy increase should be. The fuel economy increase in a lightly loaded vehicle will be less, but the “fun factor” should still be significant. Please drive carefully! DEBUTS MOD IV UPGRADES ON POWER TOUR! The Trevor Johnson CNC ported heads were disassembled to machine the stands down and bore out the pushrod holes (for bigger and stiffer 3/8 pushrods). Crane Cams newest Pro Series Shaft Rocker kit takes advantage of Crane’s Quick Lift technology but requires machining discussed in Part 2. While the heads were being machined, off came the front timing cover and in went the MikroniteÒ processed Zcam, MikroniteÒ processed timing chain set, MikroniteÒ processed oil pump gears and pump cover with Vinci High Performance ported housing. The Trevor Johnson CNC heads with Ferrea stainless steel valves and MikroniteÒ processed Crane Cams NEW High-Rate Dual Valve Springs, Part No. 144833-16, Titanium springs, retainers, locks and spring seats were torqued into place. Vinci’s head technician, Greg Warner, installed the NEW Crane Cams Pro Series Shaft Rockers to check pushrod length. Greg determined the perfect preload length to be 7.350”, Pt. No. 95627-16. Next up were the Wegner Tall Valve Covers. Greg “clayed” them for clearance, but they cleared without a hitch. Tony Shultz installed the ProCharger kit with minimal hick-ups. Who would guess a Formula would be different from a TransAm? Tony decided to install ATI’s harmonic balancer, Pt. No. 917242 with their crank pinning kit. This kit allows the 8-rib upgrade to bolt right on. Time was running out to make the Hot Rod Power Tour. Finally, at noon on Friday, the Street Shark came alive just eighteen hours before the start of the tour! Vinci installed their Supercharger, Cam #2 program at 10% rich. Tony would have preferred to have a couple days running time under his belt for such major changes but the show must go on. Dyno testing at Vinci will conclude after Tony gets his hands on a billet fuel rail and bigger injectors. Stay tuned for 600+ HP at 22 miles per gallon. 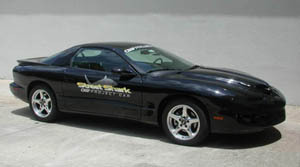 Orlando, FL: Major upgrades to Crane Cams project vehicle, Street Shark highlighted the 2006 Hot Rod Power Tour. First Crane Cams tested Mikroniteâ Technologies process on the ring and pinion. Crane Cams wanted the test to be “apples-to-apples” so an exact GM gear was purchased then Mikroniteâ processed and installed by VINCI HI-PERFORMANCE with the same Amsoil 75W-90 gear lube. We knew the horsepower and torque would improve but what about mileage? In an unofficial test, Tony Shultz, the owner, drove a controlled loop from Orlando to Daytona for two days. Driving style, same gas station, same pump, same pump shut-off was used. The results: 24.4 before Mikroniteâ, 26.35 after Mikroniteâ!! Oh by the way, the car made 13.7 more RWHP Horsepower with 15 more foot-pounds of torque!! The Power Tour attendees were amazed at the results. Street Rods, family SUV and everything in-between could relate to having all three -- horsepower torque and mileage. Also included in MOD IV was a beautiful pair of polished TALL aluminum valve covers manufactured by WEGNER Automotive Research, (920) 394-3557, their Pt. No. 1771238. Wegner tall valve covers are required with Crane Cams Shaft Rockers or LS1 Valve cover spacers, Crane Pt. No. 144601 (center bolt 1991-up) or Pt. No. 144600 (outer bolt 1997-99). The fine folks at AutoMeter gauges sent their NEW Sport Comp II full sweep gauges for Fuel Pressure, Pt. No. 3663, Boost/Vacuum, Pt. No. 3607 plus their trick triple-pillar gauge mount. Filling the third hole is Innovate Motorsports Technology, Inc.’s XD-16 Stand-a-lone Gauge kit w/ LC-1, Pt. No. 3781 Air Fuel Ratio Meter and Wideband 02 Sensor. To haul this beast down at speeds, the Street Shark uses Baer brakes calipers and slotted rotors. After discussing the MOD IV performance upgrades, Baer sent their NEW BAER/ALCON 6R MonoBlock Calipers w/ bigger rotors. Sportsman and Pro series Shaft Rockers. Crane Cams project car, Street Shark, almost didn’t make it. MOD IV changes took longer than planned (does this sound familiar?) to the point of firing it at noon Friday to start the tour Saturday morning! A special “Thanks” to Vinci High Performance for the thrash on the Street Shark. Also, a HUGE “couldn’t have done it without you” thanks to Vinnie and Patti Carmen of Sunrise Auto Body for their devotion in time and equipment. Is bigger really better? People often ask us why the main shaft diameter on the Crane shaft-mount rockers is larger than our competition. The answer is really very simple, they use smaller shafts to combat the negative effects of “bearing inertia which is a result of the needle bearings rotating in one direction and having to completely stop and reverse as the rocker “rocks” in the opposite direction. This takes more energy, increases heat, and “robs” the engine through parasitic horsepower reduction. The Crane shaft-mount rockers use a composite flat bearing that eliminates this bearing movement and inertia. The shaft is bigger because it resists deflection and eliminates nose wheel “chatter” and the resulting valve wear. Crane’s Polymer-Matrix bearing has no needle bearings as it uses a state-of-the-art composite bearing. This bearing design spreads the spring and inertia loads over a very wide area (as opposed to the very limited area at the contact points with needle bearings) with a huge reduction in “unit loading.” This reduced unit loading decreases wear and friction. Only over the last several years has this process become cost effective to include in our shaft-mount rockers. The end result is more horsepower when combined with our industry leading valve train design. Check out our catalog, e-catalog, or website to learn more about these hot selling rocker arm kits. So in this case, bigger is better. Have You Seen The Shark? Have you heard about the shark spotted in Orlando? Well, before you cancel your trip to the theme parks, let us explain. We’re talking about Crane’s “Street Shark” project car that is currently undergoing a new round of modifications in a combined effort of Crane Cams, Vinci HI-Performance, and Mikronite Technologies. What started out as a 2000 Pontiac Trans Am weighing in at a stock 266 HP quickly jumped to 400+HP at the rear wheels after the installation of a Crane roller cam, and hydraulic roller rockers, along with pushrods, retainers, and locks, topped off with our signature “Gold Race Rockers®”. This was all dyno tested, and the results are on the Crane website under the “Street Shark” tab. Now for the fun! It seems the gauntlet has been thrown down to get even more horsepower and increase gas mileage at the same time! Well, we will baseline the car on the dyno as is, and then through each stage of modification. Working hand in glove with Crane Cams and the Vinci boys, we apply the “enemy of friction”: our recently announced Mikronite® metal finishing process. This increases the residual compressive stresses, adds a special toughness to the treated surface, yet actually smoothes the surface of the metal, reducing friction. The end result improves the lubrication through thousands of uniform “tracks” for the capillary action of the oil, making for less friction and cooler operation. The “gurus” of performance at Vinci’s plan to install cam and valve train, including shaft mount rockers, timing gear and oil pump gears that have all been through the Mikronite finishing process. The metal finishing of the engine components will be followed by the transmission unit, and then by the ring and pinion! Oh, did we mention we plan to add fuel rails, larger injectors, and cooler plugs? We noted they are in the process of adding fuel pressure and boost gauges. Hmmm, we wonder what that’s for? Makes sense that Baer is considering sending a set of their new 6-piston calipers and rotors to haul this beast to a stop. How’s that for a “compliment” from Popular Hot Rodding magazine in their August issue? In providing a brief overview of Grand Sport Racing (Rolex Sports Car Series of the 24 Hours of Daytona), Popular Hot Rodding reported the banishment of Crane’s Gold Race Rockers from the track for being “just to fast,” according to the powers that be. On the first few practice runs the new GTOs (fielded by Flis Motor Sport’s Spirit of Daytona Racing) equipped with the new LS1 Gold Race Rockers with the “Quick-Lift® technology ran as fast as last season’s series-champion. And that was without any chassis tuning or tweaking! Well, they apparently knew that the rocker’s new geometry can add from 14 to 20 hp to the rear wheels and felt this was potentially unfair, so they banned the use of aftermarket rockers and mandated the use of stock rockers in the GTOs. We think Popular Hot Rodding summed it up pretty well when they commented; “It’s a rare opportunity for a company’s product to be banned and for them to actually be proud of it.” See the Crane Website for more information on Gold Race Rockers and pick up the August issue of Popular Hot Rodding for a great read. Thank you for your help and expertise. Keep up the good work. Comp (camshaft and rocker arms). for 5% of the total possibilities. So we do the best we can.! this action persists, lifter axle and wheel failure can result. as accelerated valve spring load loss; not to mention camshaft lobe failure! fulcrum is not nearly as critical as weight on the valve side. were using gave us "symmetrical lofting" of the valve. This "controlled"
"controlled lofting" when engineering a valve train! use of shaft-mounted rockers, but they really minimize pushrod problems. in our engines and drive us nuts!!! Vinci High Performance (www.vincihighperformance.com), long-time promoter of Crane Cams, took delivery of a brand-new C6 Corvette a couple of months ago. Roger, Joe, Greg, and John have been busy dynoing the stock 400 HP set-up and taking this new motor apart to check what fits and what is different on this latest version of the LS1/LS6 power plant. Initially, before the engine was released, GM informed everyone they moved the cam sensor from the rear of the cam to the front. Now, this wouldn’t be reason for concern if we were like every other performance cam company. We would just wait to check it out. Crane cams was the first core manufacturer to offer the original 8620 steel billet core for the LS-1, so we were extremely curious as to whether it would take a new core. Thanks for Vinci’s forward thinking to buy a new C6 Corvette and answer these lingering questions.